What’s the best approach for handling dead roses and other winter-killed flora? Mourn. Research. Shop. Don’t spend much time tsk-tsking about plant replacement costs. Do you seriously count the expense of fast-food or pizza on those can’t-stand-to-cook nights? Plants last years, fast food mere minutes. Why begrudge similar outlays to replace the missing teeth in your landscape’s smile? In some back yards there may be serious “dental” expenses considering the horrid winter KO’d Knock Out roses and other tough plants. Those of us who grow plants happier in warmer climes must make a decision. Is it worth years of waiting for them to return to pre-ice age sizes after being frozen to the ground? Herein lies one of the basics of success with a plant: how cold a winter can it survive? The U.S. Department of Agriculture’s hardiness zone map of the country uses colorful bands to show the lowest winter temperatures likely for every region. A Zone 5 plant, for instance, should be able to weather -20 degrees, a Zone 6 plant can handle -10 degrees. Most of Ohio is Zone 6. No fool-proof guarantee but one important factor for success. There are others to consider, so forget flower colors and cute names for a moment. Each plant needs certain environmental factors to thrive. These include sunlight, soil and moisture. Put a fern, which relishes a shady spot with moist, loamy soil, in a gravely, sunny place and you’ll find crispy fronds the first scorching July afternoon. How big will it grow. A plant that naturally spreads several feet is a poor choice for bordering a walk or driveway, unless you love pruning — frequently. Will it produce messy fruit that could mar the deck, sidewalk or driveway? How prone is it to breaking from too much snow or ice? Will it attract pesky bugs? How resistant is it to common diseases? What’s the best way to plant and care for it? In this Internet-connected age, ignorance is no excuse for buying the wrong plant. One of my go-to spots is the Plant Finder at the Missouri Botanical Garden’s website. When it comes to low-maintenance with lots of color, the new shrub roses, such as Knock Out, Easy Elegance and Drift Roses, are hard to beat. What’s not to like about flowers from spring into fall with little work? (Check out our comments at Columbus Monthly and Heartland-Gardening). Just plant them properly and make sure they get off to a good start this year. Roses aren’t the only flowering plants for season-long color. Consider shrubs with burgundy, chartreuse and variegated leaves. No dead-heading needed. 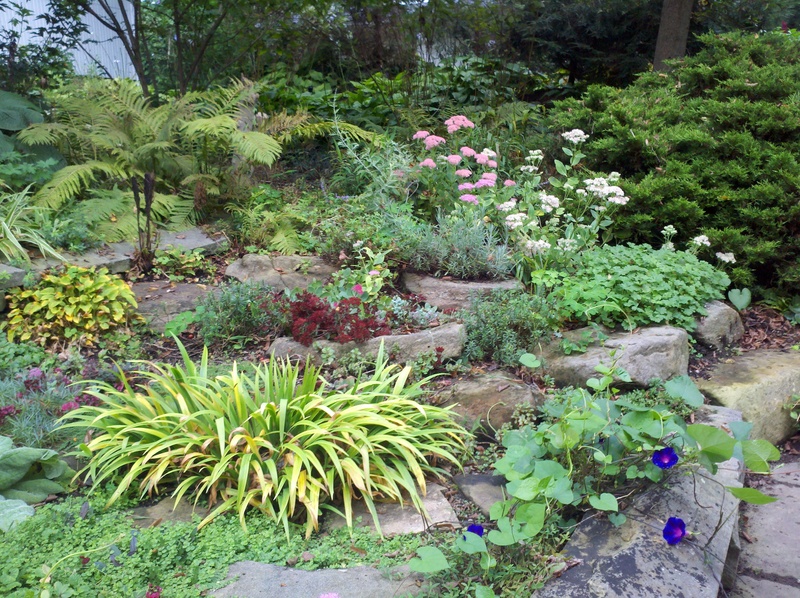 Many perennials offer the same bonus foliage features. So enough whining about winter. Start making your landscape — and you — smile again. Michael, is this your garden? It is beautiful. I wish. Mine’s in a green phase at the moment.